Capital punishment is controversial, from the morality of capital punishment to whether or not the time and manner of its infliction is humane. But both Democrats and Republicans acknowledge that California’s capital punishment system is, at a minimum, in need of reform. 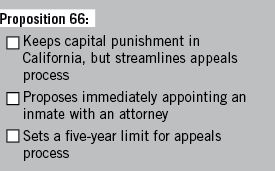 On Nov. 8, California voters will choose between two competing Propositions 62 and 66, regarding capital punishment. Should both pass, a definite and unique possibility for these measures, whichever gets the fewest “yes” votes would be rendered void. Since capital punishment’s reinstatement in 1978, more than 900 people have been sentenced to death in California. In that same time frame, only 13 people were executed — the last person was executed in January 2006. The time between when an individual is sentenced to die and the date of their execution is so long that in 2014 U.S. District Judge Cormac J. Carney held that California’s capital punishment system constituted cruel and unusual punishment in violation of the Eighth Amendment. However, the 9th Circuit Court of Appeals reversed this ruling in November 2015. Since there are only two state prisons authorized to hold death row inmates, San Quentin State Prison and the maximum-security wing of the Central California Women’s Facility, overcrowding is also a major issue. According to The Los Angeles Times, San Quentin’s death row can hold 715 inmates. As of 2015, there are 731 men currently on death row, 708 of whom are in the holding facility. The remaining 23 were held at various locations while going through appeals proceedings. The Los Angeles Times also predicts an average of 20 more inmates to be placed on death row annually. Proposition 62, initially submitted for petition by former “M*A*S*H” actor Mike Farrell, aims to address these issues by repealing capital punishment in California. This repeal would apply retroactively to all current death row inmates held in the state. Per the nonpartisan California Legislative Analyst’s Office (LAO), Proposition 62 is projected to save as much as $150 million annually upon implementation. On the other hand, Proposition 66, submitted by Kermit Alexander, whose mother, sister and two nephews were victims of a multiple homicide, would keep capital punishment legal. Rather than repealing capital punishment altogether, Proposition 66 aims to overhaul the appeals process for capital punishment cases — which are costly and drawn out procedures. Currently, it can take up to five or more years for a lawyer to even be assigned to an appeal case. In an attempt to remedy that, Proposition 66 proposes immediately appointing an inmate with a special appeals attorney. Proposition 66 also stipulates the entire appeals process must be concluded within five years, including for inmates currently within the appeal process. Its long term fiscal effects are unknown, but California LAO estimates short term spending will increase due to an accelerated spending for current cases to meet the new timeline. 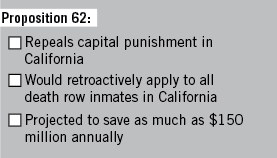 Proposition 66 also aims to address the issue of overcrowding on death row by authorizing all California state prisons to house inmates condemned to die, rather than having one holding location each for men and women. California voters are split on the question of whether to speed up the appeals process or abolish the death penalty entirely, according to a field poll released in January 2016. This is a notable difference from 2014, where 52 percent of voters favored speeding up the appeals process compared to 40 percent that favored abolishing capital punishment. According to an Oct. 2015 Gallup poll, 61 percent of adults support the use of capital punishment nationwide. Opponents of Proposition 66 are concerned by the implications of a five year time limit. Death row appeals can be intricate cases that take years to navigate. 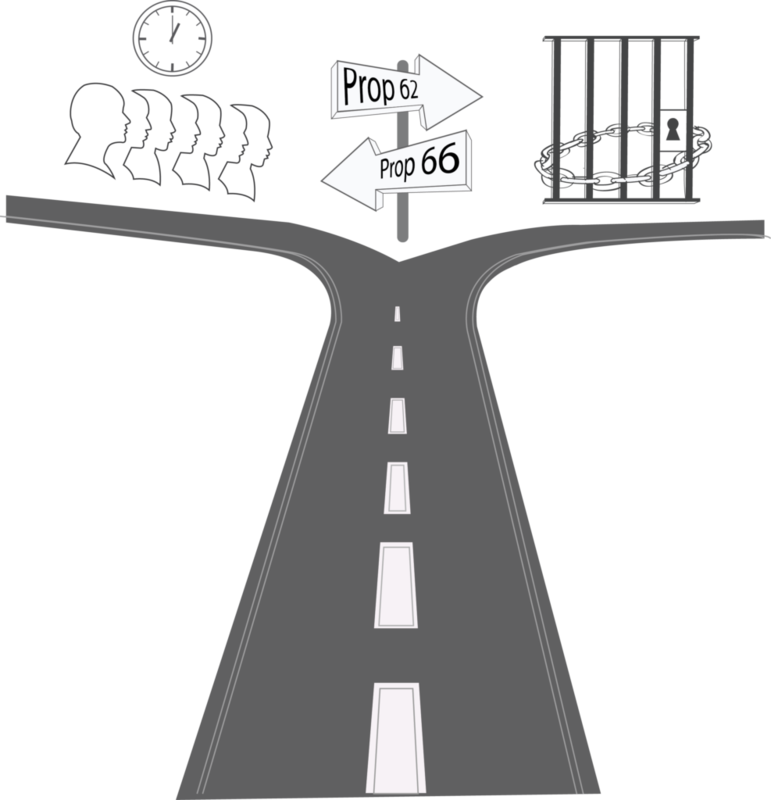 Both propositions would require either death row inmates in the case of Proposition 66 or inmates sentenced to life without parole in the case of Proposition 62 to work while incarcerated, and a percentage of their wages will be paid as restitution to the families of the victims of their crimes.